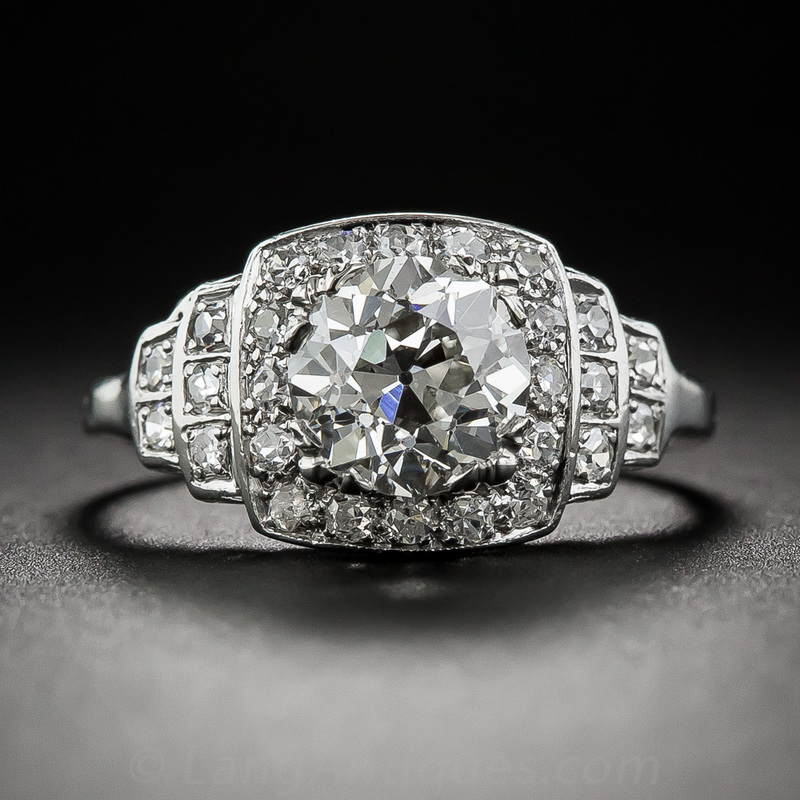 At Lang Antiques, you will find the largest selection of authentic antique and vintage engagement rings under the sun. The Georgian period, like the Victorian and Edwardian periods, derives its name and time span from the reign of British monarchs. Although there were actually four King Georges (plus a William!) 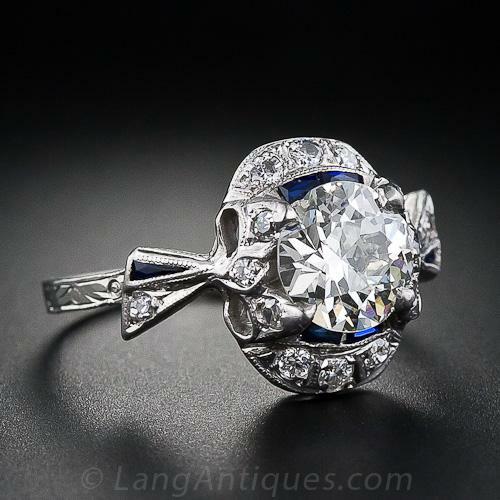 who reigned from 1714 until 1837, when discussing antique jewelry we usually refer to King Georges III & IV (1811-1830), plus William IV who briefly reigned from 1830-1837. 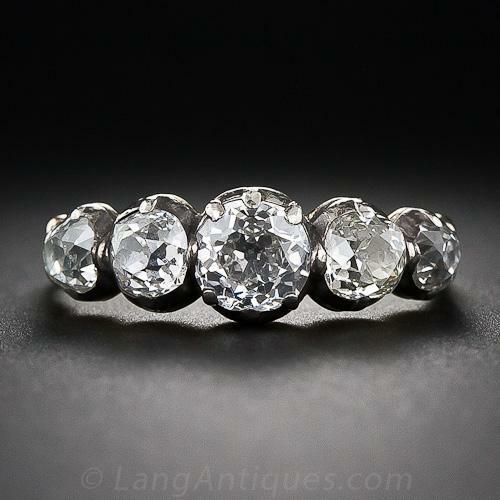 Georgian diamond rings were not intended as ‘engagement rings’. 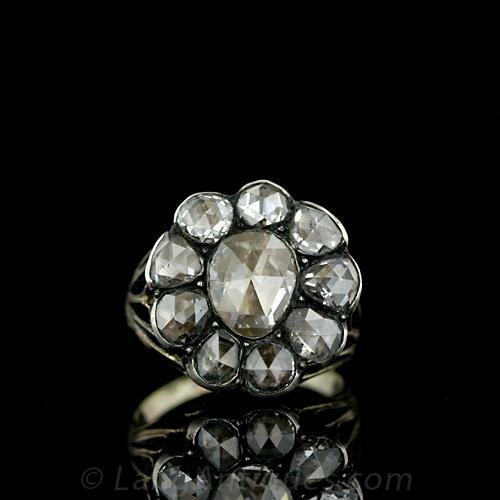 They are the oldest and rarest and, due to their age and delicacy, do not lend themselves well for everyday wear. 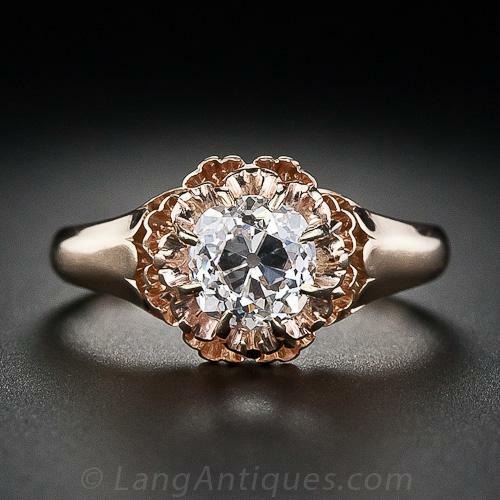 They most often are crafted in silver over gold, utilizing primitively fashioned rose-cut diamonds, which are often backed with reflective foil in closed-backed settings. 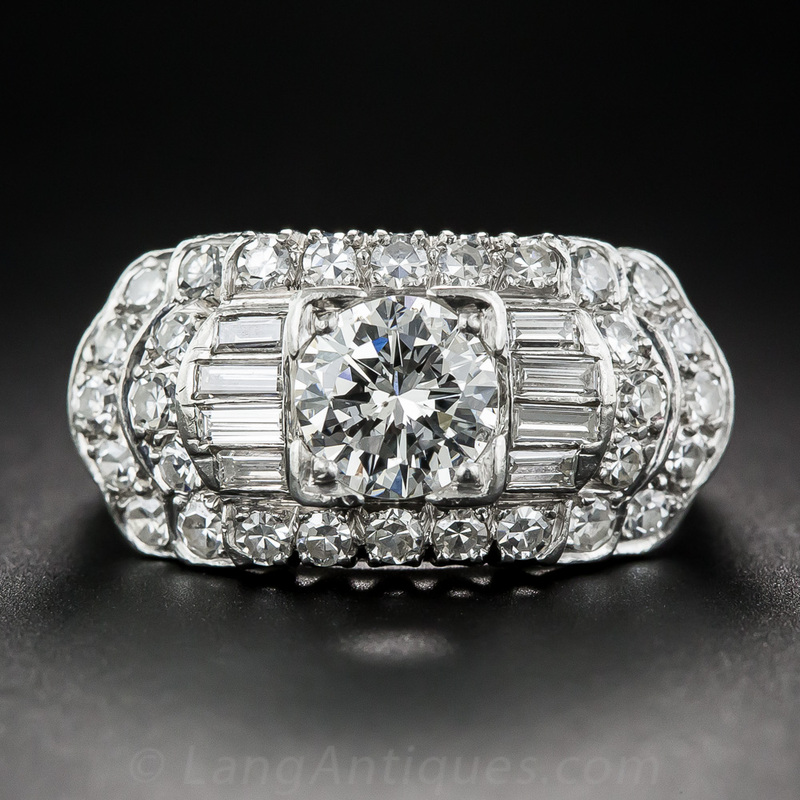 Original Georgian rings are highly sought after by antique jewelry collectors, but in order to preserve them, must be worn with extreme care. The long reign of Queen Victoria lasted from 1837 until her death in January 1901. 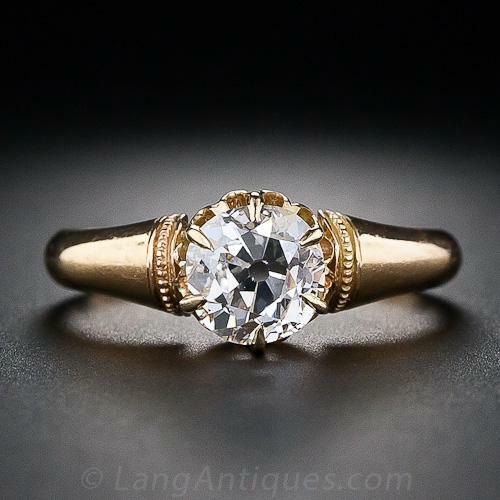 When speaking of Victorian engagement rings, we immediately think of yellow or rosy-yellow gold, and less frequently, silver over gold. 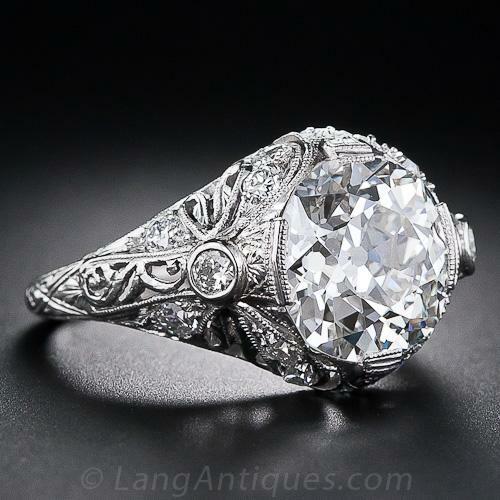 Although Victorian jewelry is generally known for its opulently detailed designs, the engagement rings from this period are generally understated. 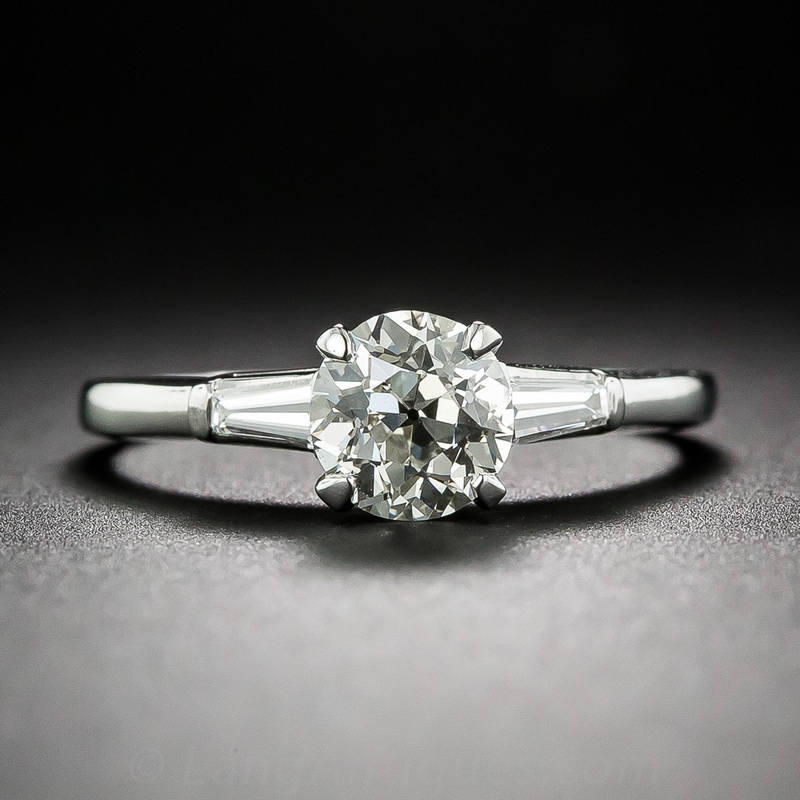 We see both solitaire diamond styles and also five-stone band or ‘carved’ rings. 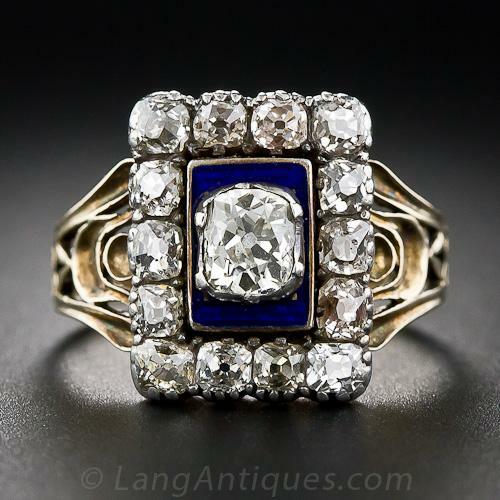 Although the reign of Edward VII covered 1901 to 1910, the Edwardian jewelry design period continues through the ‘teens, at times overlapping the previous Victorian era and the Art Deco period to come. 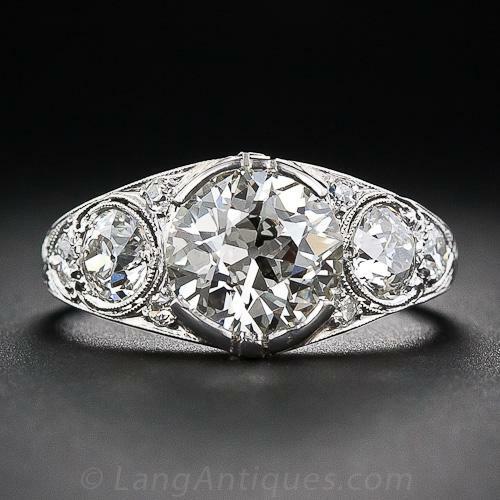 Here is when platinum and platinum over gold engagement rings make their first appearances. Flowing curves, and romantic floral, foliate and bow motifs often infuse the lacy, feminine designs. 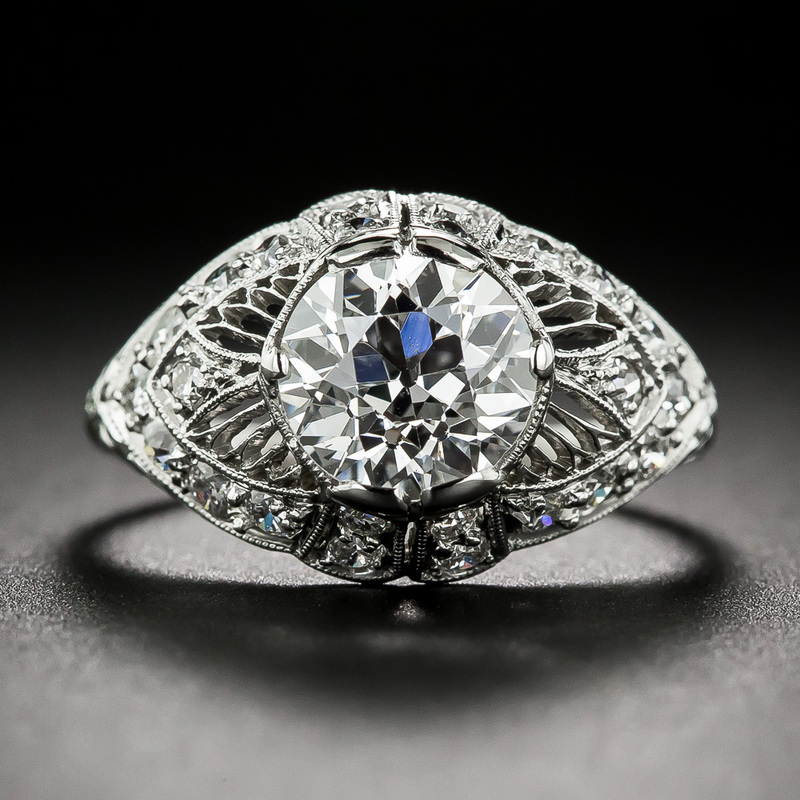 These are, by far, the most popular and enduring designs in vintage engagement rings. 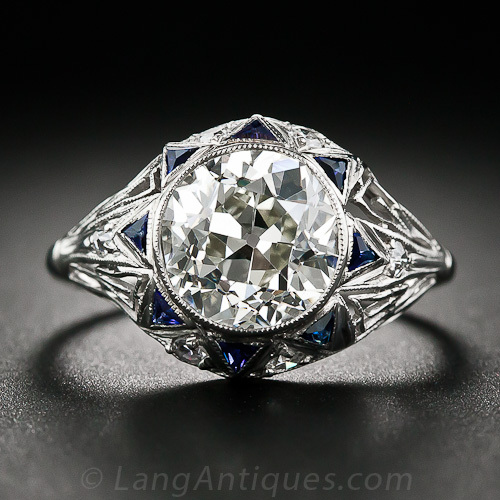 The Art Deco jewelry design period started in the early 1920s and flourished up to World War II. Platinum and white gold reigned supreme, incorporating bold geometric lines and intricate ornamentation, evocative of urbane elegance and the new ‘modernity’. 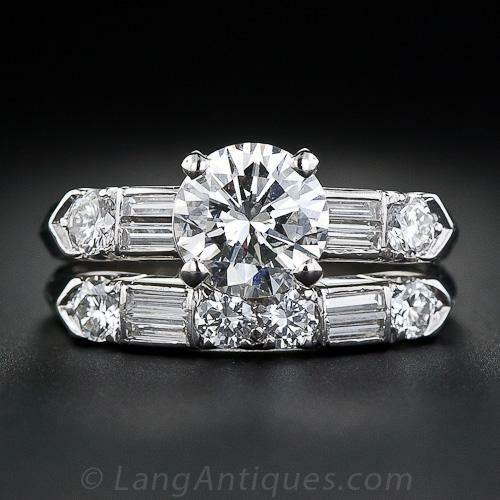 Engagement ring styles toned down during the post war years through the 1960s. 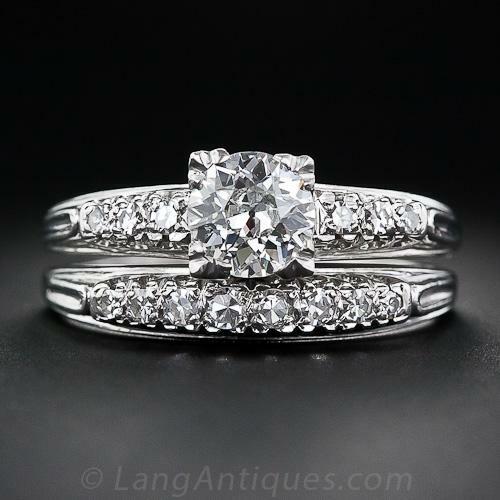 The tailored simplicity of the diamond solitaire came into vogue and wedding set combinations made their first impactful appearance. 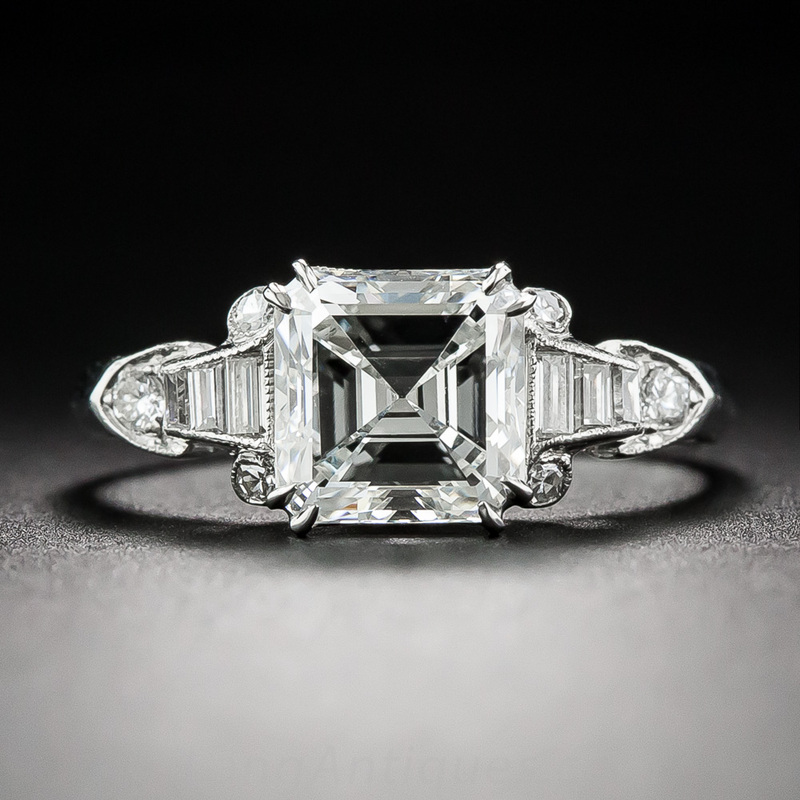 Nothing, however, is more iconic from this time than a center diamond flanked by baguettes. 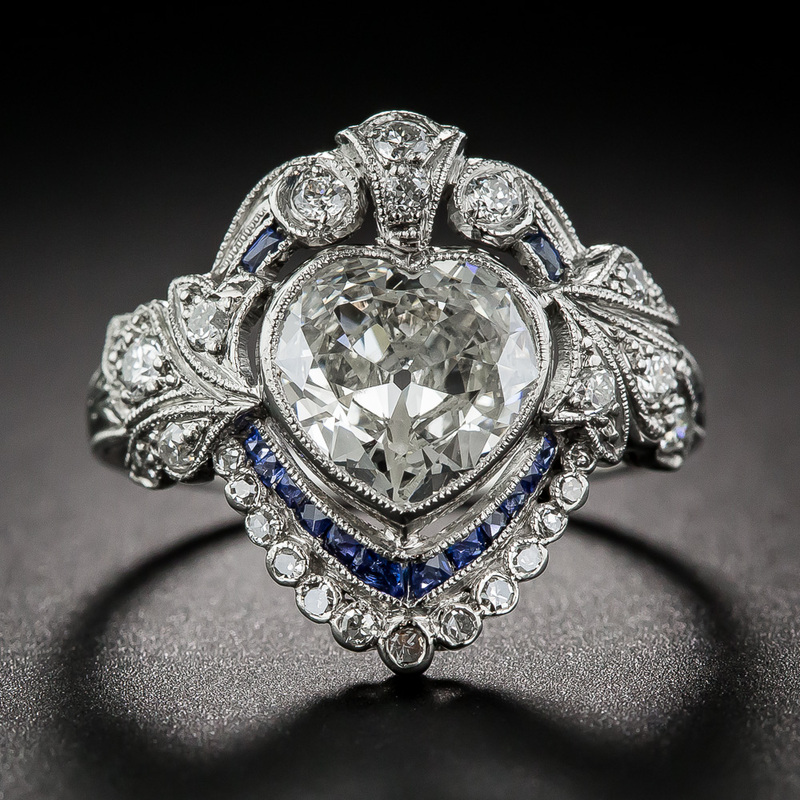 It is important to remember that the master jewelers who designed and produced engagement rings throughout these periods had no idea they were designing Victorian, Edwardian, Art Deco or Mid-Twentieth Century styles by name. Thus design elements from all of these frequently overlap one another. 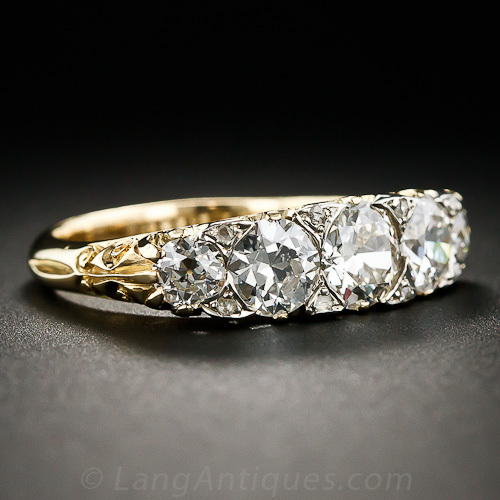 See all our vintage engagement rings or just our vintage diamond engagement rings.